Public art may be temporary or permanent artworks and may include but is not limited to sculptures, mosaics, banners, earthworks, or street furniture. The town’s Public Art Procedure recommends and defines the overall roles and responsibilities within the Public Art program. The Exhibitions Committee reviews proposals for exhibitions twice a year. Application due dates are February 1 and September 1. 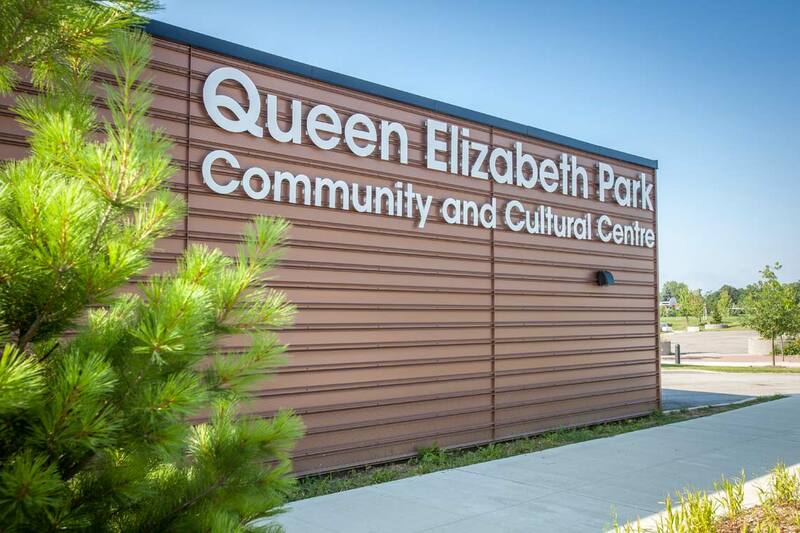 Queen Elizabeth Park Community and Cultural Centre (QEPCCC) offers FREE corridor exhibition space for youth artists ages 11 to 19. Click on the headings that follow for more information. 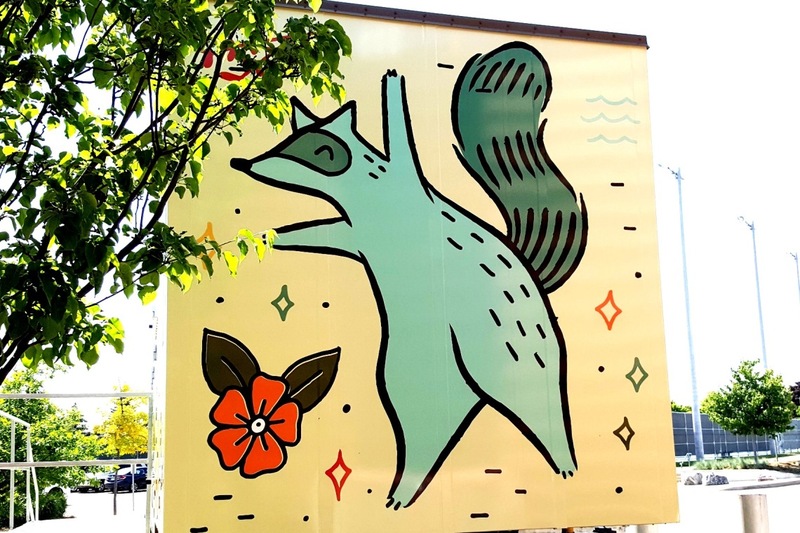 Artist Emily May Rose’s fun and bright design was the winning proposal for a mural wrap to cover the generator located at the Queen Elizabeth Community and Cultural Centre. 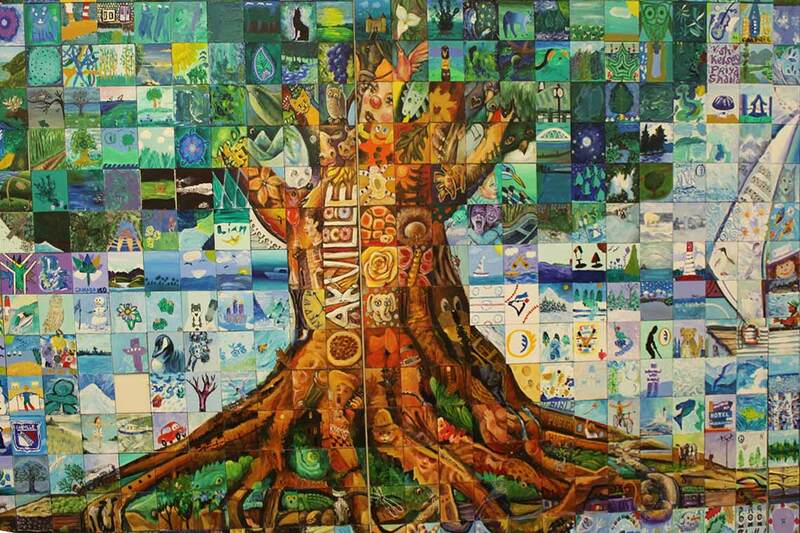 Made with careful consideration of colour and composition to create works that are both beautiful and meaningful, the mural reflects the community centre by combining aspects of the local arts and culture, recreation, nature, and history of Oakville. Emily May Rose is a Toronto-based artist and illustrator. She explores urban themes and her own personal experiences living in the city, generally placing animals like raccoons into the scenarios in a humorous way to make light of their situation. The Canada 150 Mural Mosaic Project brings together 150 communities and thousands of participants by creating community murals that visually reflect the history and culture of Canada. Oakville’s unique mural is composed of 750 tiles, which were painted by residents during registered workshops in February 2016. Led by artist Lewis Lavoie and his Mural Mosaic Team based out of Alberta, you can visit www.canada150mosaic.com to follow the mural’s progress across Canada. 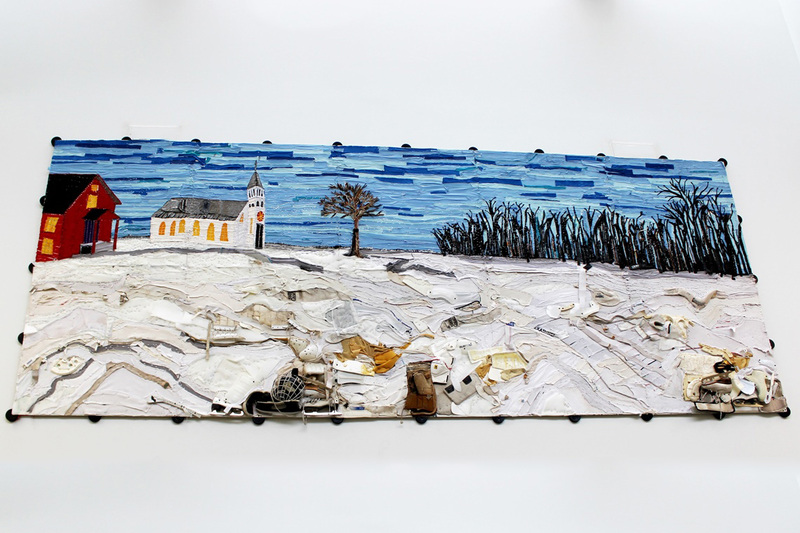 Since 2005, artist Liz Pead has been using recycled hockey gear to create large scale installation paintings which speak to the Canadian histories of textile, legend, sport and landscape painting through the Group of Seven. This work involved cutting up and affixing the bits of recycled hockey gear to create an outdoor scene. Changing group art exhibitions throughout the year by member artists. For more information about the art group go to: artworksoakville.ca. With its polished stainless steel surfaces and geometric lines, the large-scale structure is designed to be a social hub that invites exploration and reflection by visitors as they move around the piece and view it from its many angles. An independent selection committee made up of visual arts professionals and community representatives selected Marotta’s sculpture through a Public Art Call process as outlined as part of the town’s Art Policy. Please contact Tonia Di Risio, Program Supervisor – Culture at 905-845-6601, ext. 4614 or public.art@oakville.ca. Request for Expressions of Interest Deadline: Friday, March 1, 2019 by 4 p.m.
For full project, process and site details (including the application form), open the Public Art: Southeast Community Centre Expressions of Interest (EOI) PDF. 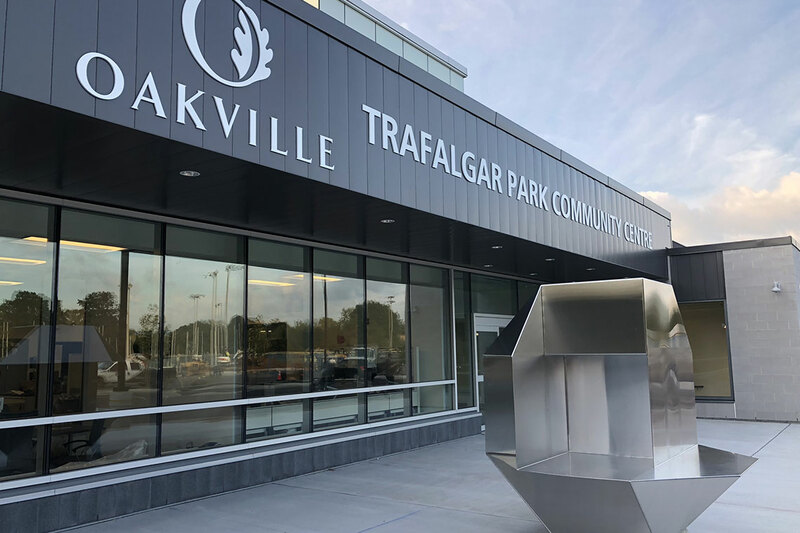 The Town of Oakville invites artists to submit expressions of interest to create a permanent indoor public artwork for the interior galleria of the Southeast Community Centre (SECC). Stage One: Applicants are reviewed based on the merit of artist’s past work, professional qualifications and experience. Stage Two: Short-listed artists will be paid an artist fee of $1,500 to develop their artwork concept proposal based on detailed artwork specifications. must incorporate themes related to the history and significance of the former site and/or may consider the facility and park activities. Join us for the reception on Saturday, March 30, from 2 to 5 p.m. The Ontario Society of Artists (OSA) are a not-for-profit association for visual artists living and working across Ontario, which promotes the visual arts through exhibitions, special projects and arts advocacy. The OSA presents a selection of works by its past president Tony Marinus Vander Voet. This exhibit pairs typewriters and sewing machines produced between 1875 and 1975. Both devices have been predominantly associated with women throughout history. 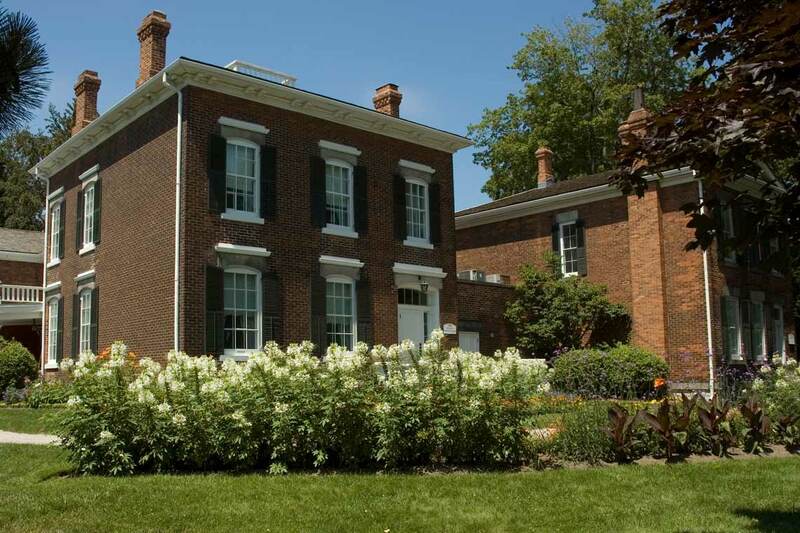 These are part of the Oakville Museum’s permanent collection and were donated, in the vast majority, by women. The pairing of the instruments provokes questions about the status of work tools used by women and how the devices may help tell the stories of the women who owned and used them. Interesting facts emerge about the technological advances, societal roles and design history of the tools as material objects. QEPCCC offers free corridor exhibition space for youth artists! The Town of Oakville’s Recreation and Culture facilities welcome exhibition proposals from professional, local, emerging artists, instructors, students, and culture groups in the areas of fine art, craft, and digital arts for temporary public exhibitions in the Corridor Galleries at QEPCCC and Trafalgar Park Community Centre. The preferred duration of group and solo shows is three to four months. Exhibiting in the Corridor Galleries is free. The Main Gallery at QEPCCC presents professional artwork by local artists. Content ranges from historical to contemporary themes. Exhibitions may also include works by national and international artists and exhibitions proposed by curators or collectives. 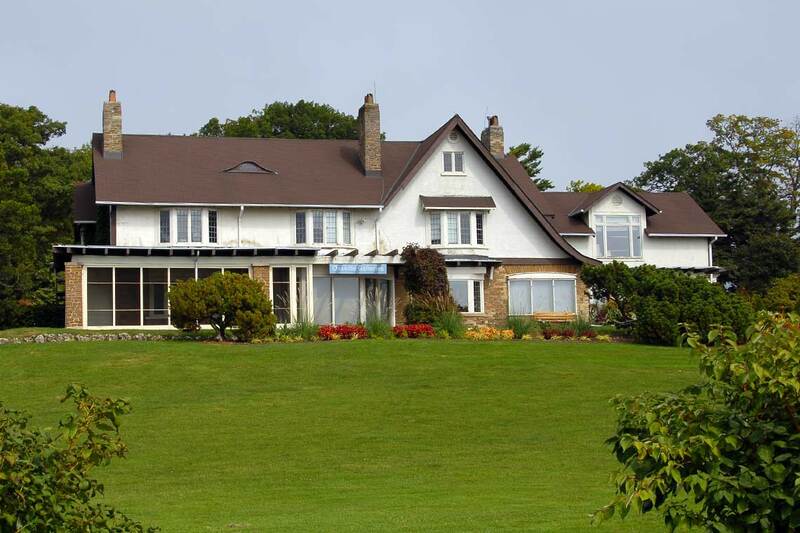 Rental rates range from $275 to $375 weekly for a minimum of three weeks. Open the Main Gallery floor plan (PDF). The Exhibitions Committee reviews proposals twice a year. Application due dates are February 1 and September 1. For an overview of the facility, open the QEPCCC Corridor Galleries map (PDF). For details on each corridor, including measurements and wall texture, open the QEPCCC Corridor Galleries Guide (PDF). QEPCCC also welcomes proposals for workshops by exhibiting artists who wish to share their techniques or expertise with the public. Written proposal with details regarding the issues or ideas explored, as well as the type of medium and format of the works to be exhibited, in three paragraphs or less. Five to ten images of your work on USB drive, CD and/or DVD. Images must be PC compatible in JPEG format, and a maximum of 1 MB file size (maximum resolution of 1024x768 pixels at 72dpi). Do not submit PowerPoint presentations, PDFs or large TIFF files. Do not send original artwork! A corresponding image list. Label all materials and list the works numerically, indicating each title, year of production, materials used and overall dimensions. Provide a current curriculum vitae (resume) listing your training/education, exhibitions, grants/awards and other professional art experience (three pages maximum). Contact the Queen Elizabeth Community and Cultural Centre at 905-815-5979 for more information. Review all applications for exhibitions. Offer constructive comment concerning the exhibition applications and to recommend applications to town staff for exhibition. Continually showcase creative work to the public that is important to the community. Priority for exhibitions will be to exhibit professional artwork by local artists in the areas of fine art, craft, performance art and digital arts, which range in content from historical to contemporary themes. Exhibitions may also include works by national and international artists and exhibitions proposed by curators. Provide a combination of gallery rentals and exhibitions organized by town staff including partnerships with internal organizations. Artists are given the opportunity to display their works through an application process. Visit the Exhibition Calls tab on this page for more information. 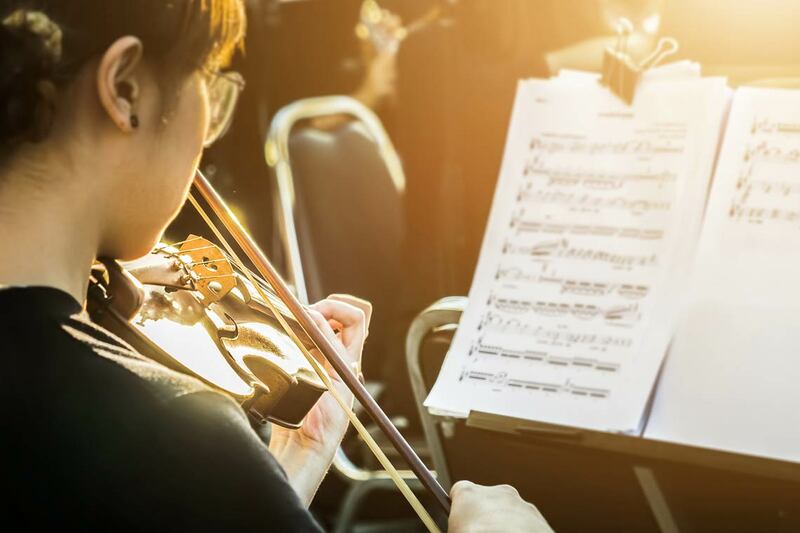 Nominations for positions on the committee shall be sought from the community at large with a preference for demonstrated knowledge of arts and culture in Oakville, reflective of our programs and members. Contact the Cultural Supervisor at tonia.dirisio@oakville.ca for the Terms of Reference for the Exhibitions Review Committee and to submit nominations.